In full disclosure, the following article was written by the fine folks at Weidenbaum & Harari, LLP – an excellent real estate law firm in New York City. I have been enthusiastically recommending my buyers and sellers to Barry Weidenbaum for a decade and plan to continue doing so for the next decade to come. This – along with every article on their site – is a great read and worthwhile information for any co-op purchaser, so I thought it would be beneficial to my readers. Thank you Barry and enjoy the article! A buyer (for purposes of this article, let’s call her Sally Streetwise) works with her broker to find a property she loves in a beautiful cooperative. The brokers work with the buyer and the seller to reach agreement on the key deal points and then turn the delicate deal over to the lawyers to conduct due diligence and to negotiate the more formal contract terms. After much back and forth between lawyers and clients, the contract is finalized, the buyer signs the contract and submits her deposit check, the seller’s attorney deposits the check to an escrow account, and the contract is fully executed. You might think this would be a great point in time for the brokers, lawyers, buyers and sellers to take a collective sigh of relief, pat themselves on the backs, and look forward to a smooth closing. Alas, there is no rest for the weary in Manhattan real estate. With the finalization of the contract comes something lawyers and brokers deal with every day of their careers, but something first-time buyers like Sally Streetwise may not yet be fully prepared: DEADLINES, and the pitfalls for missing them. The New York residential real estate contract will not satisfy itself with simply one deadline. There must be multiple deadlines, as many deadlines as there are subway lines (or double-parked cars) in Manhattan: Deadlines to apply for mortgages. Deadlines to obtain Commitment Letters. Deadlines to submit board packages. Deadlines for providing notices. Deadlines to schedule closings. Deadlines to adjourn closings. Deadlines that increase stress and confuse everyone throughout the process. While some lawyers, bankers, and brokers push forward as quickly as possible hoping that they avoid any deadline land mines, experienced practitioners will help the buyer navigate deadlines to lessen their stress and protect their best interests. Let’s spend a few minutes to get acquainted with two of the most significant deadlines our buyer will encounter once she gets into contract: the board package submission deadline and the loan Commitment Letter deadline (“Commitment Date”). In the typical contract for the purchase of a cooperative unit, the answer is clear: Sally Streetwise has ten business days to submit her board package. Unless she has three business days. But remember that the three-business-day deadline begins to run at the expiration of a completely different thirty or forty-five-calendar-day Commitment Date. Sometimes. Or it begins to run sooner. If Sally Streetwise is not seeking financing, and is proceeding “all cash,” she will need to submit her board package within ten business days of her attorney’s receipt of a fully executed contract (unless otherwise negotiated). If Sally is seeking financing, then the determining factor for the board package deadline will be whether a commitment letter is required to be submitted with her board package. If the board does not require a commitment letter as part of the board package, then the original ten-business-day deadline is still in effect. However, most boards do require a commitment letter because most boards reasonably believe that if a buyer is unable to obtain a commitment letter, the deal will not go forward. There would be no point wasting time reviewing such an application. If the board requires a commitment letter as part of the board package, then it’s important to note that the contract will include the Commitment Date of usually thirty or forty-five days from the date Sally’s attorney receives a fully executed contract. Sally’s board package deadline also then hinges on whether her contract has a Commitment Letter contingency. If Sally’s contract has a Commitment Letter contingency, then her deadline is three business days from the earlier of when she receives the Commitment Letter or the Commitment Date. If, on the other hand, Sally is seeking financing but her transaction does not include a Commitment Letter contingency, then Sally’s deadline is three business days from the earlier of: (1) when she receives the Commitment Letter or (2) the Commitment Date, with one important caveat: even if Sally has not obtained a Commitment Letter by the Commitment Date, she must still submit her board package within three business days from the Commitment Date. 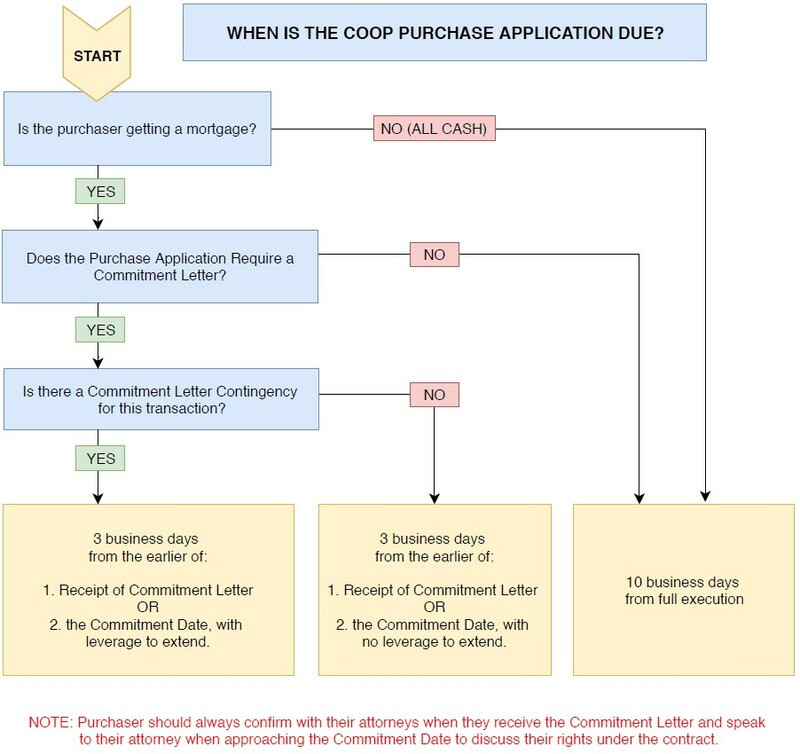 Given the complexity described above, we would always recommend that a potential buyer, with the assistance of her broker, obtain a copy of the board application before entering into the contract for the purchase of the cooperative unit. This way they will know ahead of time whether the board requires the commitment letter as part of the board package and thus the deadline to submit that package. The broker and the buyer should work together to get the board package as complete as possible so that the only open item remaining while approaching the Commitment Date will be the lender’s issuance of a Commitment Letter. One common pitfall to note: we all come across deadlines in our daily lives. When facing a deadline, there’s often an impulse to hurry up and beat the deadline by as many days as you can. In the context of the Commitment Date described above, and board package deadline, however, this is not necessarily the best path forward. Once parties are in contract, Sally Streetwise should start working on her loan with her banker and on the board package with her broker. The goal for both is not necessarily to beat the deadlines to a pulp, but rather to meet the deadlines with the best work product possible within the time permitted. For bankers working on the commitment letter, a number of open conditions may initially exist on the commitment letter and the banker should work with the client to try to eliminate as many open conditions as possible prior to the Commitment Date. For example, if a banker states that Sally Streetwise’s parents must provide a “gift letter” for funds that were given to her to purchase her first home, it would be best to obtain the gift letter and have that condition cleared from the commitment letter, rather than having the commitment letter issued with the open condition. What if Sally’s parents refuse to sign a “gift letter” for the funds they provided her? These types of potential issues would be better discovered while in the contingency period rather than after the contingency has lapsed. It is also critical to have an experienced banker who is familiar with the interplay of the Commitment Date and the board package timeframes. Less experienced bankers may issue a commitment letter quickly in an apparent effort to impress the borrower, but inadvertently trigger the 3-day deadline described above when the borrower is not yet ready to submit the board package. With respect to the board package, Sally Streetwise will want to have an open dialogue with both her banker and her broker, so that they take the time to prepare a board package that shows Sally in the best light and is most likely to result in board approval. Sometimes this means waiting until the most recent bank statements are available from the buyer’s bank, or waiting until the perfect source of a professional reference is back from vacation. There is one notable exception to the above. What should Sally do when she obtains a commitment letter that is still subject to a satisfactory appraisal, but the appraisal has not yet been conducted or approved by the bank? In such a case, the typical real estate contract states that a commitment letter subject to an appraisal is not a “Commitment Letter” as defined in the contract unless and until the appraisal condition is satisfied. The first goal would be to make sure the appraisal is satisfied before sending the Commitment Letter as part of the board package. However, there are times that the broker will want to submit the board package quickly, for example to make the next board meeting deadline, and so they would prefer to submit the commitment letter with the appraisal condition. In such a case, the buyer may decide to submit the commitment letter even though it is still subject to an appraisal, but the buyer should state that it is a preliminary commitment letter with their right to cancel still intact under the standard commitment letter contingency clause. One final note on deadline extensions: buyers should take note that in the world of contract law, there is a difference between a deadline where a buyer is given a right of action and a deadline where a buyer has no such right. For example, take the case where a buyer with a finance contingency has done her best to cooperate with the bank to obtain a commitment letter, but through no fault of her own, the bank is unable to issue the commitment letter prior to the typical thirty-day deadline. In such a case, the buyer would potentially have the right to cancel the contract. Given that right, there is a possibility that a buyer could request from the seller an extension of that deadline rather exercising the right of cancellation. This wielding of the implied power to cancel often results in the seller granting an extension. Contrast this situation with the deadline to submit a board package. Here, in the normal circumstance, the buyer does not have a right to cancel if the board package is not submitted on time, and therefore may not be successful in seeking an extension of such a time. Seeking an extension in such a circumstance comes with risk. If the seller does not agree (and there is no requirement that they do) then the buyer must rush to submit the board package or risk being held in breach of the contract, which potentially subjects the buyer to the loss of the deposit. If a broker or client is concerned with the board package submission deadline, the most effective time to address this concern is during the contract negotiation stage, when additional time can be added to the contract. Due to the complex interplay of deadlines described herein, it is imperative that a buyer work with seasoned professionals when selecting a lawyer, broker, and banker. Each of these professionals works with the others to ensure that the deadlines are effectively met and with information that puts the buyer in the best possible position to succeed in the transaction. PLEASE NOTE: This article is intended for informational purposes only and does not constitute the dissemination of legal advice. The deadlines and some of the legal language discussed herein is subject to negotiation between the parties involved and/or interpretation by a court of law. We encourage you to speak with the attorney handling your specific transaction for further details. Posted in 2018, board of directors, board package, deadlines, Decision-Making, deposit, documentation, down payment, due diligence, Eirik Gislason, Halstead, Halstead Property, Halstead Real Estate, Manhattan, Uncategorized.Tagged advice, Brokers, competition, contracts, new york, NYC, Real Estate, research, Sales, strategy, team.